The Best Brexit blogs from thousands of top Brexit blogs in our index using search and social metrics. Data will be refreshed once a week. Brexit newsletter is a comprehensive summary of the day's most important blog posts and news articles from the best Brexit websites on the web, and delivered to your email inbox each morning. To subscribe, simply provide us with your email address. United Kingdom About Blog Brexit Central is here to provide an online home for all wanting to follow the twists and turns of our departure from the EU and hold the government to carrying out the instructions of the British public. Facebook fans 9,060. Twitter followers 18,982. United Kingdom About Blog Get Britain Out is a campaign to Get Britain Out of the European Union and into the wider world, trading freely and cooperating with all nations. Facebook fans 221,536. Twitter followers 20,538. Zurich, Switzerland About Blog We help clients overcome the challenges of competing in the global economy. We solve complex legal problems across borders and practice areas. We discuss about Brexit and what it means for your business. Facebook fans 9,954. Twitter followers 24,073. United Kingdom About Blog We will be documenting events, outcomes and decisions on a daily basis. Leave EU in its new form is also dedicated to cutting through the noise as well as the scaremongering over the outcome of a historic referendum. Facebook fans 874,597. Twitter followers 137,396. Facebook fans 3,097. Twitter followers 21,991. About Blog We have created this Brexit blog to provide up to date analysis and legal commentary as the new Brexit landscape evolves, addressing key questions and topics of interest to our clients across the different industry sectors in which they operate. Facebook fans 3,285. Twitter followers 13,501. About Blog Brexit Legal helps you understand the impact and ramifications of the UK vote to leave the EU, and advocating to advance your business objectives. Facebook fans 2,174. Twitter followers 10,669. San Francisco, CA About Blog Welcome to /r/Brexit! A sub reddit all about discussion of the United Kingdom's impending exit from the European Union. Facebook fans 1,145,281. Twitter followers 506,102. Facebook fans 7,692,712. Twitter followers 6,766,601. New York About Blog BuzzFeed is building the defining news and entertainment company for the social mobile age. Find the latest Brexit Buzz on Buzfeed. Facebook fans 10,568,979. Twitter followers 5,971,190. London About Blog The Independent is the world's most free-thinking newspaper. It contains all the latest breaking news on Brexit. Browse The Independent’s complete collection of articles and commentary on Brexit. Facebook fans 7,426,705. Twitter followers 2,351,067. United States About Blog Get the latest Brexit news and analysis from CNBC,. Facebook fans 2,164,765. Twitter followers 2,763,884. Facebook fans 2,962,632. Twitter followers 1,327,385. Facebook fans 3,640,160. Twitter followers 2,998,044. London, United Kingdom About Blog The BMJ's Brexit blog consists of comments and opinions from The BMJ's international community of readers, authors, and editors. Facebook fans 70,301. Twitter followers 257,315. London, England About Blog LSE Brexit is a multi-disciplinary, evidence-based blog run by the London School of Economics and Political Science. Our aim is to inform the debate in the aftermath of the referendum on Britain’s membership of the European Union with accessible commentary and research. Facebook fans 1,426. Twitter followers 18,441. Facebook fans 108,538. Twitter followers 146,610. Cardiff, UK About Blog The Welsh Brexit blog aims to inform and encourage constructive debate and analysis on issues relating to Wales and the UK's exit of the European Union. Facebook fans n/a. Twitter followers 65,081. Facebook fans 3,681. Twitter followers 8,460. London About Blog Kingsley Napley is an internationally recognised law firm based in Central London. We support individuals and businesses in resolving conflict, safeguarding their futures and maximising opportunities. London, Brussels About Blog Open Europe’s mission is to develop the intellectual framework for Britain’s new relationship with the European Union and its trading relations with the rest of the world. Our work will ensure that Government policy and the wider public debate about Britain’s future is rational and well informed. Facebook fans 2,978. Twitter followers 46,553. Facebook fans n/a. Twitter followers 25,040. Facebook fans n/a. Twitter followers 4,094. United Kingdom About Blog EU ROPE is written by Jon Danzig. Jon Danzig is an award winning medical journalist and formerly an investigative journalist at the BBC. He specialises in health, human rights and the European Union. Facebook fans 4,287. Twitter followers 2,222. About Blog Brexit Time provides a running commentary on Brexit. University College London About Blog Welcome to the UCL European Institute blog on Brexit and Britain's relationship with the EU. UCL Brexit Blog features a range of blogs, videos and publications on topics related to Brexit, British politics and EU politics from UCL academics and other experts. Facebook fans n/a. Twitter followers 3,355. Europe and London About Blog Welcome to the official website for the research project BrExpats. Brexit Brits Abroad is an innovative sociological study funded by the UK in a Changing Europe run by Dr. Michaela Benson and Professor Karen O'Reilly that questions what Brexit means for Britons resident. Facebook fans 175. Twitter followers 813. United Kingdom About Blog The Brexit Blog analyzes Brexit as it develops. It is written by Chris Grey. The Brexit Blog is about the consequences of 'Brexit' - Britain's decision to leave the European Union. Northern Ireland About Blog Brexit Border is your independent source of facts, news and analysis on the impact of Brexit on the island of Ireland. Facebook fans 408. Twitter followers 349. Stockholm, Sweden About Blog Keep up with information about Brexit. Bristol About Blog Pete North Politics Blog is written by Pete North. He writes about his thoughts on Brexit. Facebook fans n/a. Twitter followers 4,753. Europe About Blog Brexit Shambles, run by a group of like minded people, is a project born from the rejection of the post-truth society socially aware Europeans awoke to in 2016. Facebook fans n/a. Twitter followers 4,282. Norwich/York/Belfast About Blog Welcome to the authoritative and impartial source for independent research on how Brexit is affecting the environment, policy and governance. We are a team of academic experts analysing the implications of Brexit for UK/EU environmental policy and governance. Paris, France About Blog Votes for Expat Brits blog is a blog to support votes for the expatriate British and campaigning for the right to vote in UK general elections for all British expats who are currently banned after 15 years abroad. Facebook fans 315. Twitter followers 491. About Blog UWE Bristol Brexit Blog is curated by academics and researchers from the UWE Bristol on Brexit. It contains knowledge and research articles from academic staff at UWE Bristol. United Kingdom About Blog Channel Brexit is Pro-Brexit., Advocating for a Clean Brexit. Restoration of UK Parliamentary sovereignty. Brexit is the start of a process of accountability, localism & a pro-business economy. About Blog Reimagining Europe discusses about the Christian Reflections on Brexit. London About Blog Brexit Law tracks the legal issues arising from Brexit.. It is written by members of Brick Court Chambers, one of London's leading barristers' chambers. The referendum on 23 June 2016 in the United Kingdom resulted in a majority vote in favour of the UK’s withdrawal from the European Union. Facebook fans n/a. Twitter followers 4,457. United Kingdom About Blog Our Brexit Blog" is the companion to the powerful best-selling book "In Limbo: Brexit testimonies from EU citizens in the UK. Its aim is to advertise the book and continue collecting and publishing the true stories of EU citizens affected by Brexit. Facebook fans n/a. Twitter followers 7,157. Europe About Blog Ideas on Europe is a blog hosting service which provides an independent forum for informed analysis, comment and debate. It hosts blogs by organisations and individuals actively engaged in European issues. The Brexit Blog analyses the UK-EU relations. Facebook fans n/a. Twitter followers 12,456. London About Blog The mission of Better Off Out is to explain why the United Kingdom would be Better Off Out of the European Union and to fight for the UK to regain its freedom and independence from the unelected and unaccountable EU. We are run by unelected Brussels bureaucrats and this must stop. Facebook fans 15,184. Twitter followers 35,325. Facebook fans 4,335. Twitter followers 5,725. About Blog Simeon Stylites is a political ascetic dedicated to balanced analysis. He provides balanced Brexit related analysis. 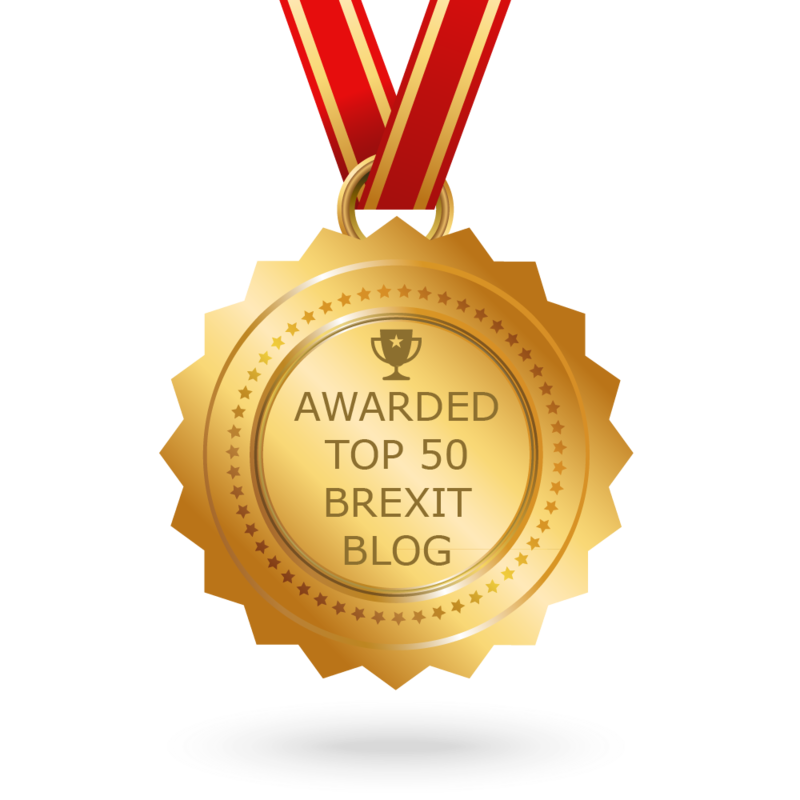 CONGRATULATIONS to every blogger that has made this Top Brexit Blogs list! This is the most comprehensive list of best Brexit blogs on the internet and I’m honoured to have you as part of this! I personally give you a high-five and want to thank you for your contribution to this world.